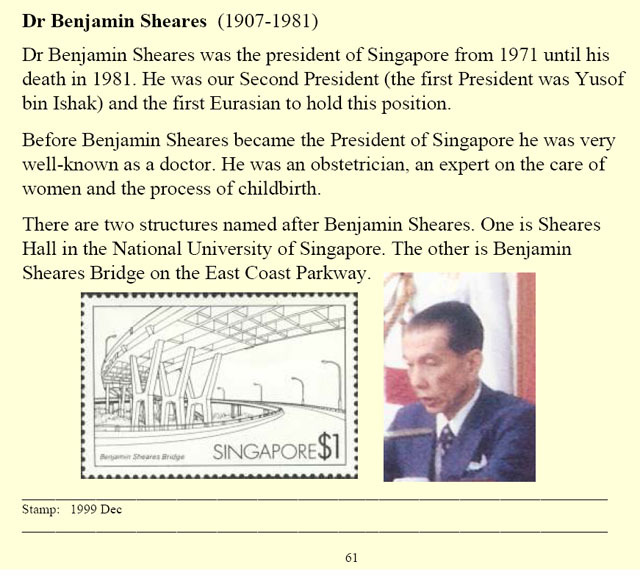 Dr Benjamin Sheares was the president of Singapore from 1971 until his death in 1981. He was our Second President (the first President was Yusof bin Ishak) and the first Eurasian to hold this position. Before Benjamin Sheares became the President of Singapore he was very well-known as a doctor. He was an obstetrician, an expert on the care of women and the process of childbirth. There are two structures named after Benjamin Sheares. One is Sheares Hall in the National University of Singapore. The other is Benjamin Sheares Bridge on the East Coast Parkway.